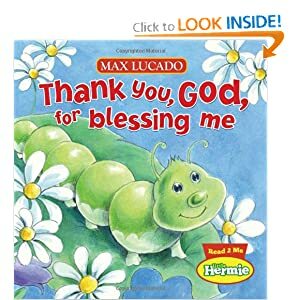 "Thank You, God, For Blessing Me" is a board book written as a part of the "Little Hermie" series by Max Lucado. This hardback book contains a sweet little poem about all that Hermie is thankful for. It's size is perfect for tiny hands to hold! My 7 month old daughter loved this book, and it is often hard to keep her attention. I was excited to receive this book and look forward to reading the other "Little Hermie" books as well. I highly recommend this book to parents of children aged 0-3.